A moderately sized and very readable summary of the growth and formation of Hitler’s career and the Nazi party. A great start for basic factual information and understanding. An extensive history of Hitler’s life, including his rise to power, military achievements and failures, ideology, and what he left behind in his wake. Very comprehensive, and like all Spartacus articles, contains links within the text to relevant info. A compilation of primary source audio and video put on the web. Includes a huge section dedicated to Hitler, as well as propaganda posters/broadcasts and more. This provides an excellent view into Nazi Germany. A very extensive history of Hitler from his beginnings to the very end. This is broken up chronologically into many sections and provides excellent information about his childhood in particular. This is a primary source document in which Mussolini considers and explains the benefits of his fascist system and contrasts it with communism and democracy. The actual source of this, interestingly, is from an Italian encyclopedia article which Mussolini wrote. This page has 6 propaganda images. Clicking on an image brings about a detailed analysis and examination of the ideas, themes, and emotions that the Nazi party were trying to spread. An informative article on Hitler’s strengths and weaknesses as a military leader and commander. Discusses his strategy, philosophies, and relations with his subordinates. Broken up into 7 subsections. 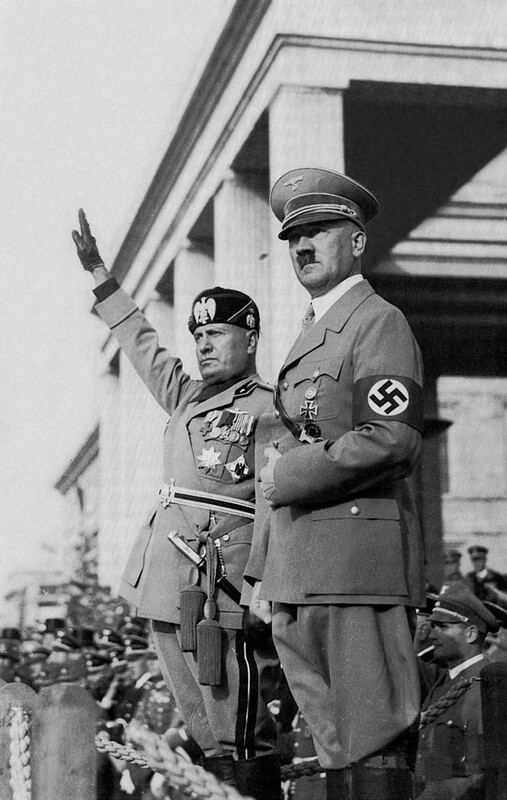 An excellent summary/biography of Mussolini’s life and climb up the political ladder. Also briefly covers his military and social endeavours. There are many links within the text which can be explored for further information. This site contains primary source speeches and writings from major German figures such as Hitler. Also has visual material, propaganda links, examples of anti-Semitic material, and much more. This is a very solid overview of the formation and founding ideas of the Nazi party, and how the party functioned over time. Discusses founding members and rival parties as well. A production of the Discover Channel’s Unsolved History series. A collection of photos that helps one understand Hitler’s final moments. Clicking on the photos reveals a description and analysis of the photo’s subject and its relevance to Hitler and his final days. A summary of fascism and more specifically how Hitler’s integration and use of it in Germany. Provides a quick but informative basic summary of the role and purpose of the Hitler Youth in Nazi Germany. This site covers Mussolini’s invasion of Abyssinia and the role of intervention from other nations at that point. The goal is to formulate an opinion on whether Mussolini was a hero or villain. Chamberlain and Hitler, 1938: What was Chamberlain trying to do? This activity has students observe primary source documents from a meeting between Neville Chamberlain and Adolf Hitler just prior to the initiation of World War II. Provides a great view into the European tensions and political dealings. This activity makes the reader view Hitler using the information available about him at the time, not with hindsight, so it can be understood why he wasn’t stopped earlier. This lesson provides and understanding to how the rest of the world viewed Hitler prior to World War II. Assassinate Hitler: How did the British plan to kill Hitler? This LearningCurve activity put the student in the place of the British SOE with the goal of deciding upon the optimal method to terminate Hitler. Students are to look at the dangers involved and the chances of success. When these plans were revealed in July 1998 they caused world media interest. This is a unique chance to work with these original and secret documents. The goal of this lesson plan is to allow students to attain their own opinion on how Hitler came to rise to power. Web and computer based research is the main means of teaching in this lesson plan.